Q: I can not figure out how to get the grey separator gif to show up in the navigation bar scripts. Where in the DeluxeTuner do you select that? use "Add separator" button on the mainwidow of Deluxe Tuner. Notice that I've used my on separator image, you should use your own image. Q: If you look at our site in IE (PC) the deluxemenu looks great justified left w/ our logo justified right. When you look at it in Safari (Mac) the dhtml menu dropdown is stretched across the entire width of the page and our logo is no longer in view (yuk!). XmlTool visual tree for xml files WDVL - Web Developers Virtual Library - XmlTool is registered hier ?? One Stop XML Resource Centre - XmlTool is registered hier ? 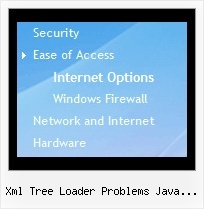 xml tree loader Struggling for a week now to get an xml tree to load. Using asp with vs2005 the xml file is sitting in the root of my project. Not an ajax tree.